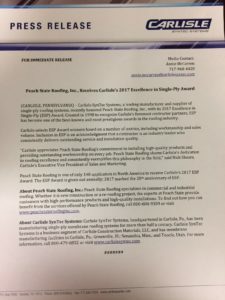 (Carlisle, Pennsylvania) – Carlisle SynTec Systems, a leading manufacturer and supplier of single-ply roofing systems, recently honored Peach State Roofing, Inc., with its 2017 Excellence in Single-Ply (ESP) Award. Created in 1998 to recognize Carlisle’s foremost contractor partners, ESP has become one of the best-known and most prestigious awards in the roofing industry. Carlisle selects ESP Award winners based on a number of metrics, including workmanship and sales volume. Inclusion in ESP is an acknowledgement that a contractor is an industry leader who consistently delivers outstanding service and installation quality. “Carlisle appreciates Peach State Roofing’s commitment to installing high-quality products and providing outstanding workmanship on every job. Peach State Roofing shares Carlisle’s dedication to roofing excellence and consistently exemplifies this philosophy in the field,” said Nick Shears, Carlisle’s Executive Vice President of Sales and Marketing. Peach State Roofing is one of only 140 applicators in North America to receive Carlisle’s 2017 ESP Award. The ESP award is given out annually; 2017 marked the 20th anniversary of ESP.